On a quiet Sunday afternoon, why not entertain the neighborhood by playing your saxophone? Christmas songs? "Is it christmas time?" Yea, it is. I guess the saxophone player wasn't aware. Nate- not bad tunes, however, you knows how sound carries up. 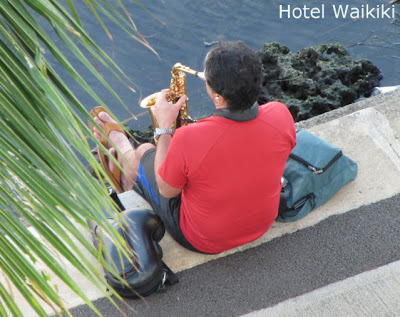 When I passed the saxophone player across the street from him at ground level, I could barely hear the "music." Cloudia- at least it's not the conga drums. Aloha. Looking at the pic, all I can think of is that if there were a sax player outside I'd know he was nuts. At 38°C his lips would freeze solid on the mouthpiece.